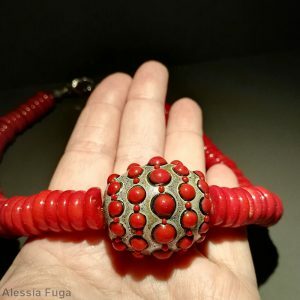 Big “Fenice” bead decorated with red and ivory dots. 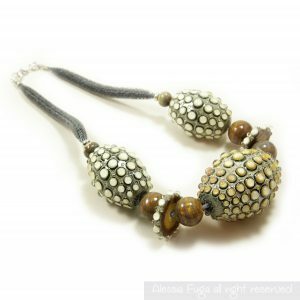 This bead is a one of a kind, as the other bead of my “Fenice” series and, also for this one, the oxidized 999 silver leaf on the base gives to the base of the bead its characteristic sparkling look. 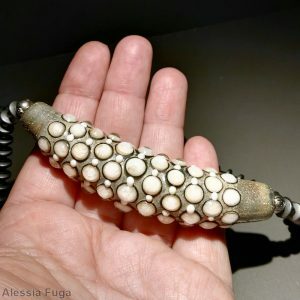 Another interesting thing about this kind of beads is that, exactly like silver,during years, they continue to react with air and slightly change color. I started make extremely big sized bead to improve my skills in heat control. 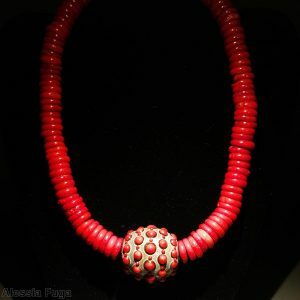 It sorted out that this kind of beads are great on a base as home decoration object so if you would like to have this bead on a stand, please ask for a quotation. 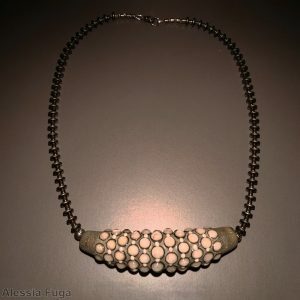 A necklace with 3 giant "Fenice" beads in ivory and clear, plus matching discs and round spacers. Crew-neck lenght blown beads necklace in shades of light topaz, grass green and teal. Total lenght is approx. 47cm.